Official MakerBot Replicator 2 Extruder Alternative Builds Upon Community Mods #3dthursday « Adafruit Industries – Makers, hackers, artists, designers and engineers! Here’s a great story from the Thingiverse world. Whosawhatsis’ Minimalist MK7 Replacement mod has been a favorite for almost three years on Thingiverse given the widespread use of the MK7 toolhead for the still active MakerBot Cupcake, Thing-O-Matics, and in custom desktop 3D printers. His mod uses minimal additional “vitamin” hardware and printed parts to replace the delrin filament plunger with a spring tensioner, an approach which helps for printing a range of slightly fluctuating filament diameters among other things, opening up users to more filament vendors. Emmett’s popular MK8 edition, based on Whosawhatsis’ mod, is in extensive use throughout the Replicator 1 community. And now whpthomas, “Wingcommander,” has a great version of the mod for the Rep2/2x community. There are certain issues that the wrong amount of plunger tension can cause. For example, too much tension can cause a clicking sound when the end of the filament isn’t able to move past the drive gear. Too little tension can cause the filament to stop feeding altogether. There should be a design that makes the process much easier. Enter Thingiverse user whpthomas who came up with an improvement that has really seen some traction. It’s a great mod that makes the machine more reliable over the long haul. 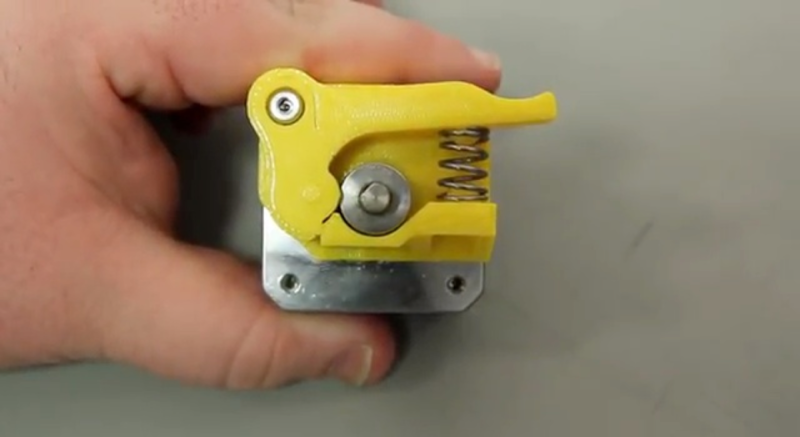 Thing #42250 “Replicator 2 Extruder Upgrade” by whpthomas, is one of these very useful designs. It’s based on an extruder mod from Thingiverse superstar emmett, who based his design on one from another star user, whosawhatsis. The basic idea of this series of designs is to use a spring-loaded arm to squeeze the filament between the drive gear and a bearing. After extensive testing, we’ve decided that this approach is too good to ignore. We’ve modified this design to reuse the spring we already use for the build plate. We also added in a little bit of extra guidance for the filament where it enters the hot end of the extruder. Take a look on our Thingiverse page to see our adaptation of whpthomas’ great design.